Prints on labels up to 4'' wide. 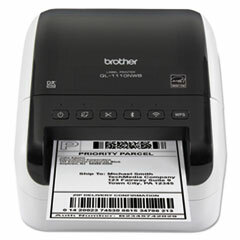 Great for printing shipping postage labels. 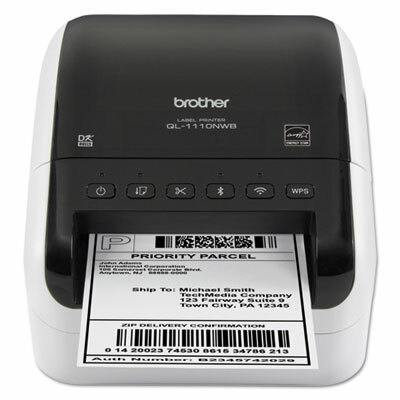 The automatic crop function lets online sellers easily print product and other barcode labels from A4/Letter size label sheet templates (Windows only). Create cost-effective paper labels for packages, envelopes, postage and more. The automatic crop function lets online sellers easily print product and other barcode labels from A4/Letter size label sheet templates (Windows only). Fast printing up to 69 standard address labels per minute with black text at 300 dpi. USB host interface offers additional functionality. Auto cutter allows for printing single or multiple labels at a time, eliminating wasted label sheets. The "Plug & Label" feature supports quick label printing of most basic labels - no software installation required for Windows PCs. Print from Microsoft Word/Excel/Outlook. Needs no ink or toner. Machine Depth: 8.7" Machine Height: 5.9"